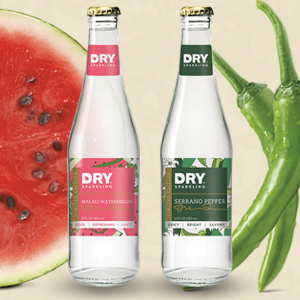 For Summer of 2016, DRY is launching two seasonal flavors, Malali Watermelon and Serrano Pepper. While watermelon is a classic Summer flavor, serrano is something that’s unique as far as beverage flavors go. Spicy flavors are on certainly on trend across the broad spectrum of food and cocktails, and it’s been slowly migrating into RTD beverage form, with the main thrust from cold-pressed juice products (e.g. ginger shots). For a product like DRY, which is known for having a very light and clean flavor, this presents an additional challenge, creating something that doesn’t totally overwhelm your palate. Fortunately, we think they’ve succeeded. Using the flavor of serrano, which has a flavor similar to a bell pepper but with a spicy finish, they’ve been able to craft something that’s light, balanced, and very enjoyable. Added sugar (14g per bottle) helps round things out, and the end result is a beverage that is definitely one of our favorites when it comes to the DRY lineup. But let’s not forget about the Malali Watermelon. While this isn’t as likely to catch the eye the way that the Serrano offering will, it’s still a very well executed and enjoyable flavor. The watermelon flavor is extremely accurate and, when paired with the added sugar (19g per bottle), is really easy to chug down. However, calling it Malali, which is an heirloom variety of watermelon, puts a bit too much emphasis on the source and inclusion of actual watermelon juice (which isn’t the case). Plus, it makes the name a bit of a mouthful. The packaging for both of the products is a 12 oz. glass bottle that, like the other flavors of DRY, has a clean and somewhat minimalist look. On each of the labels you’ll find a three word description -- “cool, refreshing, juicy” for the watermelon and “spicy, bright, savory” for the serrano -- that does a great job of capturing the essence of each flavor. All in all, these are some really top notch seasonal additions to the DRY lineup. And we’d be remiss if we didn’t say that the Serrano Pepper variety seems like one that could certainly stick around beyond the Summer.